Extends Layered Navigation with fast SEO friendly AJAX, Multiple Select, Checkboxes, SEO incl. 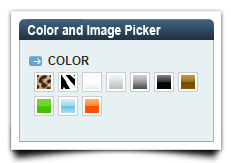 paging and sorting, Price Slider, Show More / Show Less, Radio Buttons, Drop-Down lists. It is full package of all our Layered Navigation extensions. 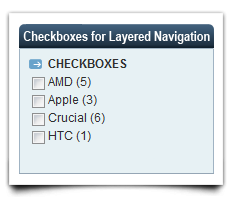 Not only saves you money but also allows you to use future Layered Navigation extensions for free. This extension bundles all layered navigation extensions from MANAdev.com into one easy-to-install package. SEO (Search Engine Optimization). 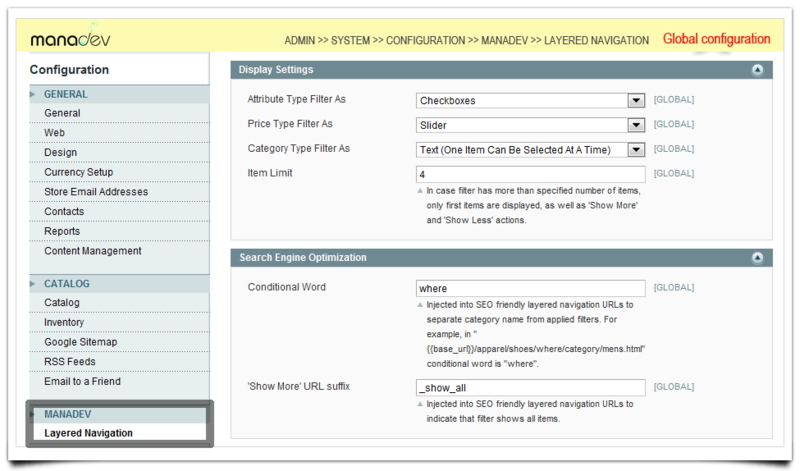 Control page title tags content for every category or even filter applied. 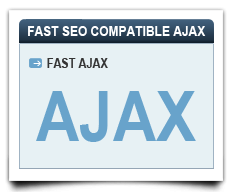 Fast AJAX feature is even more convenient to use. Positioning - possibility to put filters on 3 locations at the same time - left, top and right. Possibility to have the same filter on all three positions. Possibility to control state (filters selected) for all tree positions individually. Responsive design ready, filters collapse to accordion type menu depending on screen size you set in pixels, check Store View 2 on our demo site. 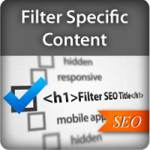 Different top (above products) filter templates - horizontally laid filter template, drop down menu filter template or responsive Accordion menu type filter template for mobile devices with touch screens. - choose per store view which one to use. Show/Hide filters for any category. Possibility to have different filter labels for every category. Multiple Select with or without Checkboxes. It allows store customers to apply several layered navigation filter options while browsing catalog categories or catalog search results. 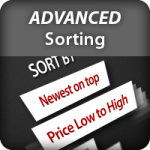 Multiple selection feature works in price filter as well as in all attribute-based filters. Reverse mode - let customers to select options they are not interested in. 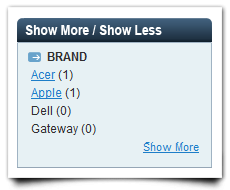 Show More / Show Less functionality allows to make long lists of filter values more convenient to store customers by adding "Show More" and "Show Less" actions to such filters.There are 3 types for it - expand/collapse list, scroll list and popup window (for very long lists of attributes). Price Slider - slider for attributes of type price. Slider for custom Price type attributes like weight, width, screen size, etc. Round units if you need - 100cm to 1m, 1024MB to 1 TB, etc. Enable additional inputs (text boxes) for manual value entering. Possibility to slide only through existing values. Few slider styles. 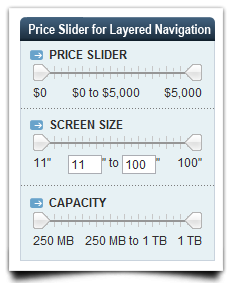 Min/Max Slider allows to combine 2 price type attributes in one slider. 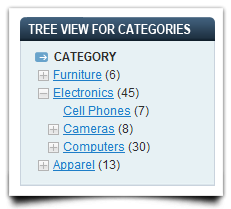 Show or hide separate categories block on categories pages. Help tooltips near filter name for filter label. Session tracking, remembers selected filters on Back button. 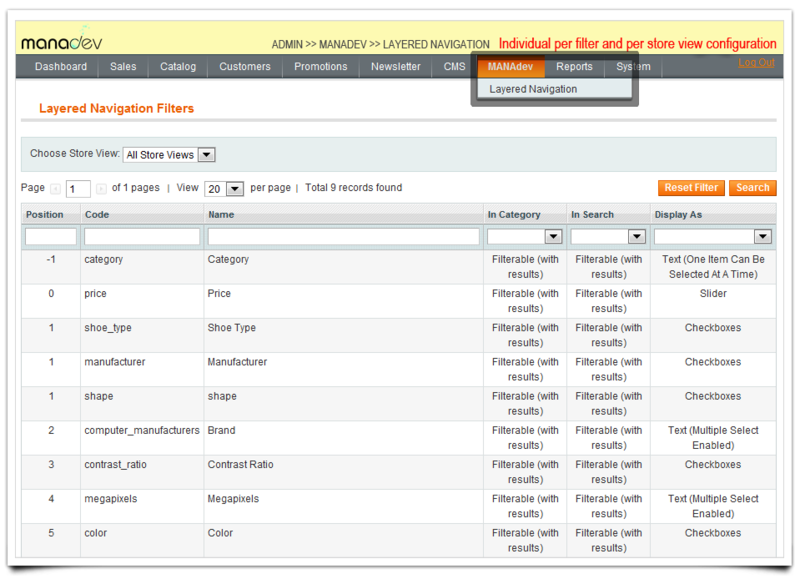 You can use layered navigation on home page or any other CMS page..
Full Magento Enterprise Edition SOLR support. 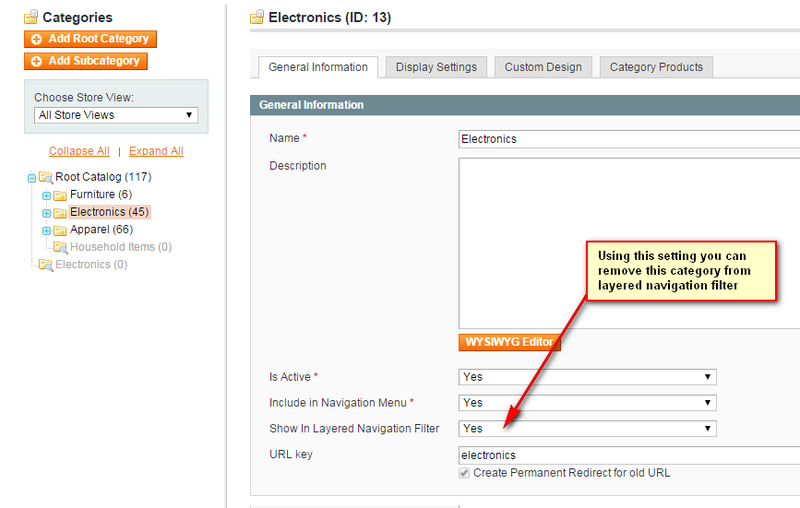 Standard (one from many) Magento Layered Navigation functionality with or without radio buttons. I have just installed this extension on my old magento 1.9 store and it works great. It required only minor tweak ( just 2 lines of code) in order to work flawlessly with my Porto theme. I will definitively buy M2 version for my new store. The only thing i regret is that i found it so late. I wish i had it years ago. I have used different layered navigation extension for M1 and this is so far, the bets of the best! There are similar extension like this from famous Magento developers like Amasty and Aheadworks, but so far, this is the best and most feature-rich Layered Navigation for Magento. You won't regret buying this! Working with the latest M1 version 1.9.3.4 that was released last July 2017. 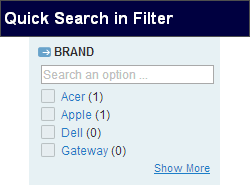 I have used other navigations and had seo issues, but this one includes noindex on the filters which is perfect. I was really happy to see some extra options that made a huge difference, such as having the filters above the products on mobile view, in a really neat and useable way. 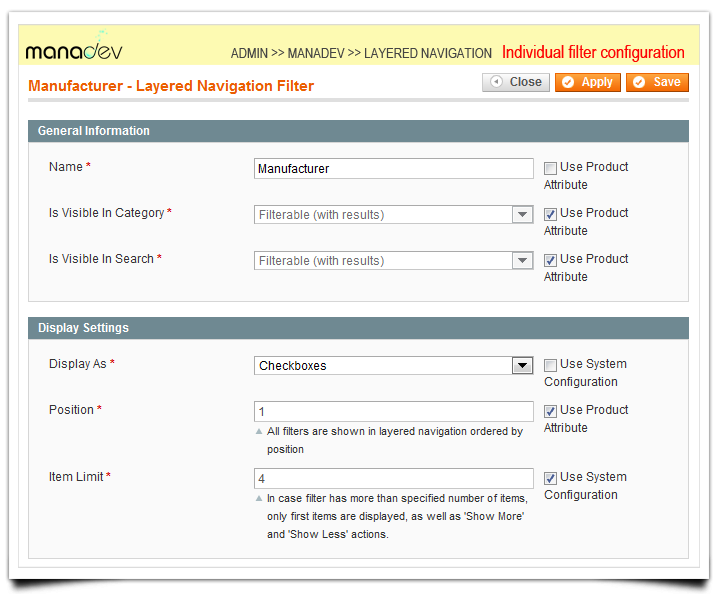 Also the option to have the ticked filters go to the top of the list is a major benefit for customers. Support was also really quick to answer my questions, recommended. For a small business like ours, PPC is just too expensive. The SEO features built into your layered navigation extension is just what we needed to improve our rankings in the search results. You guys are The Best. I'd been searching for over a month for a good SEO-friendly layered navigation extension that will work seamlessly with my theme. I was just about to give up when I stumbled across MANAdev! The layered navigation extension is everything I was looking for and more! It allows me to fully configure each aspect of the layered navigation block so that I can have it exactly how I want it, which is crucial when you have a great number of products in your store. 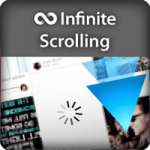 I'd fully recommend this extension to anyone who needs a high-quality yet simple solution for layered navigation. The support has been incredible too. My theme has a few functions which were conflicting with the extension, but Monika jumped right in and fixed the issue for me. The SEO Layered Navigation Plus extension is now working on my site and looks great! I have the "SEO Layered Navigation Plus" module and it works great. I really like that I can change the order of the attributes. I had an issue with ff and ie and sent the developer an email at the end of the day. When I got to work the next day the problems were fixed. I am very impressed with the response time; It is always nice when things get fixed while you sleep. Just bought Layered Navigation Plus. Module works perfectly. On installation a problem occured (caused by me). Help was very fast and the fix was easy. I bought the advanced Layered Navigation. It did not work because of an old version of Ajax (installed by an other plugin). After contacting manadev they fixed it whitin an hour. Great support! This extension saved us so much time and aggravation! And it looks and works just great! Highly recommended! This extension is worth the price. It works perfect out of the box and all the functions are working as described. Very good extension if your site navigation is based in attributes and you want to improve the user experience. Goede plugin en voor iedereen aan te raden ! Perfect extension. I had a few problems with installation on my mulitple site. After mailing with supportdesk the issue was solved very quick. We have been using this product for some time and support is always available to assist. The extension functions perfectly, and extremely SEO friendly, which were of our main requirements. I compared about 25 extensions for layered navigation and I gave favor to MANAdev´s layered navigation with all options for 99$. After simple installation there appeared some issues with other 3rd party extensions. I contacted the support several times and I was really impressed, that within minutes they sent me the solution. 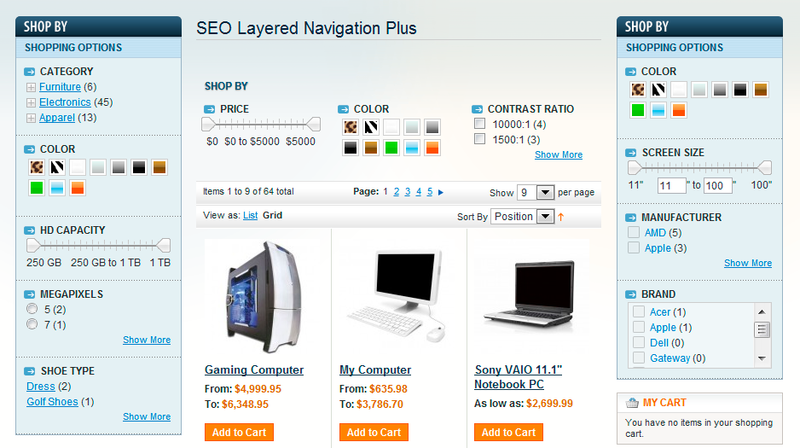 Just buy Seo Layered Navigation Plus. You will save time and money. These guys also provide amazing support. Definitely the best investment I've made. Had no problem integrating the extension with the theme. Thank you for excellent extensions and customer care ! Had some issues with template files on a heavily modified magento store but fantastic and fast tech support solved my issue :) Would recommend this extension. I can only recommend this extension. Firstly because it works, secondly because of the outstanding and responsive customer support manaDEV has. Their support led me through the process of installing and configuring it, when problems showed up, they were there to help. Even requested features were built into an update within a few hours. Thank you for this extension! We were looking for an ajax layered navigation as the attributes list was very long and we needed them to be able to collapse/expand. This was the perfect solution and so many options and features that make your layered nav work for pretty much any option. Had a couple of minor requests from their support, they responded quickly with easy fixes. One of the best extensions we've purchased in a long time. 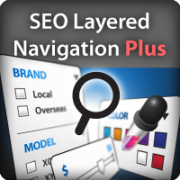 Excellent product - The best layered navigation SEO - Amazing Support! he extension is written beautifully, extremely feature-rich; the code is clean and easy to follow. 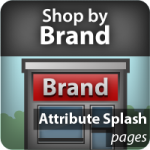 It's a MUST for store owners who want to increase conversion rates. No one wants to spend too much time to find what they want. This extension will help you convert visitors to customers which in turn will boost your sales. The team behind the extension is probably the best magento certified developers out there, who will simply solve any problem - response time is less than 1 hour. In addition, they are professional in everything they doing, while maintaining a friendly tone. I really like the features of this extension. 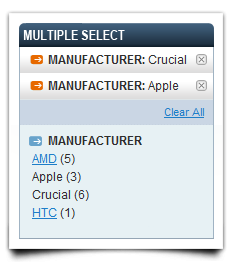 Especially the way to group categories with a popup box or a scrollable list (with search option). The extension is also a SEO update! I also like the slider feature, wich is not only for prices. I use the slider for something else then the price and it turns out to work great! I cannot say enough about this developer. We got this extension and at first had a few compatibility issues, but the team at ManaDev went above and beyond and helped us get on track. I would highly recommend this extension and all others from this company. This extension is really well built and well thought out. We opted to go with the paid version (SEO Layered Navigation Plus ) because we wanted all the features rolled into one product. So far it's worked very well even for us with our custom theme. The responsive design was a requirement for us, so this also took care of that need. Monika with the support team is amazing and has helped us solve all the issues we have had so far. Take my advice, it's worth spending the money to get the paid version. It's for sure a great value add for the cost to any ecom site. Best extension of it's kind and their support is great! Extension is written very well and it works flawlessly. I had a problem when installing - theme was not done correctly - but they've fixed it for me in under one hour free of charge. Amazing! Otherwise the extension has loads of configuration options so that you can make it work as you want. It' actually the first extension that i didn't need to modify to customize. Do Yourself a favor. 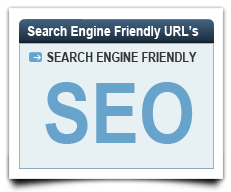 Buy $$99.00 SEO Version of it. It is Worth every penny. Works on 1.8CE. Why? I have been dealing with other competitor of the same type of extension, since past 5 days, and they wanted to charge me of extra $300 because it was not compatible, until i found this extension today, purchased it, uploaded it, boom, it works... Anyone who is looking for multi level layered navi, this is it. don't look no further. Support? I think support is the main area for developer when they face issues, and i MUST admit, they been outstanding, i am in US and they been talking to me real time. No waiting 24 hours. Real time communication with support. Try it, you will not regret. Easy install and it works great! My webshop contains 20000+ supplement products and it is essential that my visitors can easily find my products by the use of filters. I came across the “seo layered navigation” from MANAdev and it stood out from the rest because of it’s many functions and ways to make it easier for your customers to find the product their looking for.